So, why are we here? Simple concept, really. 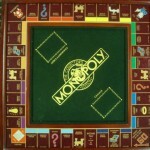 I want a lighted Monopoly board. Why? Good question, but really just because I do. I’ve been a long time fan of Monopoly, playing since I was… well, I don’t know how old but I’ve played as long as I remember. Certainly earlier than it’s recommended, anyway. Nowadays, I can’t get people to play with me because (they say) I’m just too good. Frankly, I can’t remember actually playing anybody around here in the first place, so I don’t know what they would base that on. They probably just remember the interminable games that everyone grew up playing. If you play the game right, it does end, I promise! 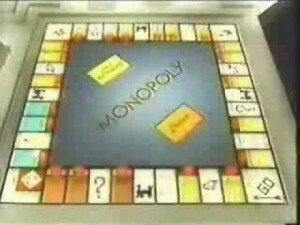 Anyway, one of the things I remember from childhood was a brief game show version of Monopoly. It only ran for one summer, but boy did I love to watch that. The gameplay was completely different from the actual game, but that didn’t matter. Know why? 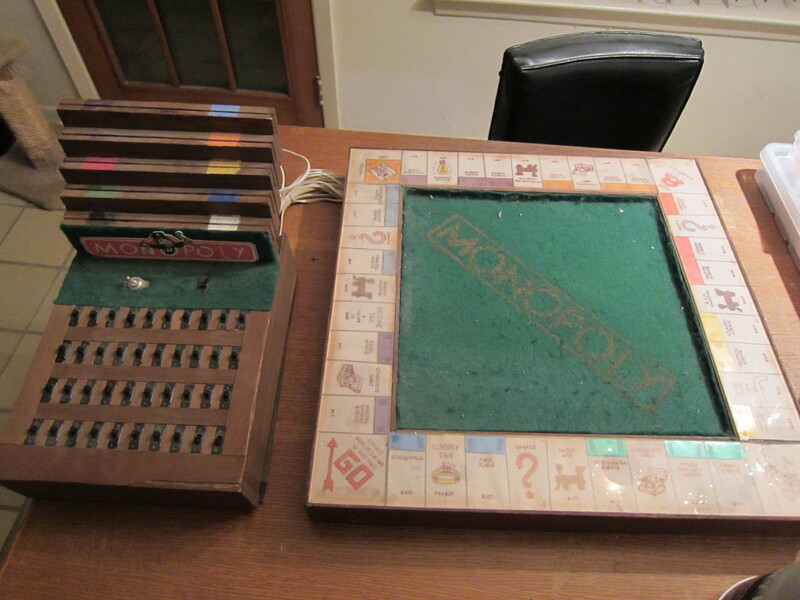 Because they had an awesome, gigantic, lighted game board. My impressionable little mind was set: I had to have one of my own. Perhaps a more reasonable size, though. My Dad was a pretty able woodworker, so when I mentioned this idea as a kid, he took it as an opportunity to do a project with me. I like to say we built it together, but I’m pretty sure he did all the building while I watched and dreamed about how awesome it would be. Of course, back then we didn’t have access to nearly the same amount of cool stuff for making as we have now, so rather than using spiffy LEDs and microcontrollers, our solution was based on Christmas tree lights and a huge bank of switches. But you know what? It worked. Note that I do say “worked”, past tense. After digging this up, I decided to try to turn it on. Didn’t work straight away, so I opened up the control panel to figure out why. After looking at how we actually made this “work”, I quickly decided that for safety’s sake, I would never be trying to turn it on again. Somehow, connections carrying line voltage and made with electrical tape just don’t give me much confidence. 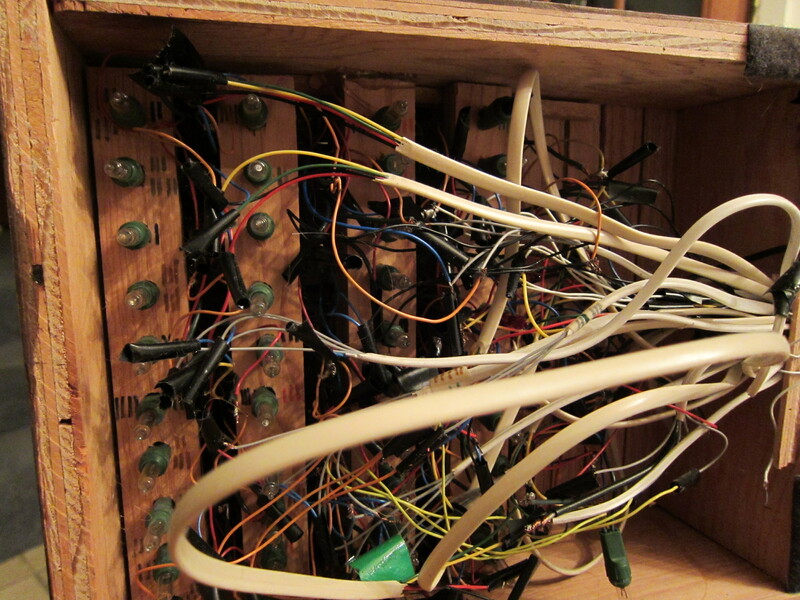 You may also note the surprising number of lights inside the control box itself. Well, when you’re dealing with 1980’s Christmas tree lights, it turns out that lighting up one light with the same current you otherwise would use for 40 makes that one light burn very brightly. To combat this, clearly you should always have 40 lights burning. So, 40 in the board, 40 in the box, and every switch changes current from using one in the board to one in the box instead, or vice versa. Crude, but effective, and it kept all the lights a consistent level. 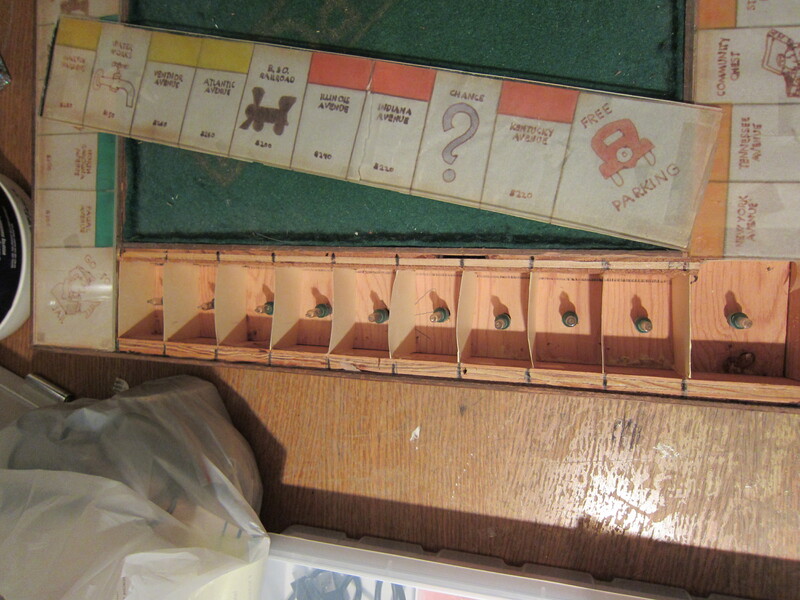 The board itself was pretty basic construction, with a plywood base and sides, a hollow center to run wiring, and acrylic panels to form the actual game tracks. The spaces were all hand drawn by yours truly on tracing paper from an actual game board. Unfortunately, the years have not been kind to the paper or ink, and most of the spaces are faded and discolored badly. 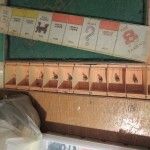 The color bars on the properties were cut out of a variety of plastic films and layered to build up the appropriate colors. 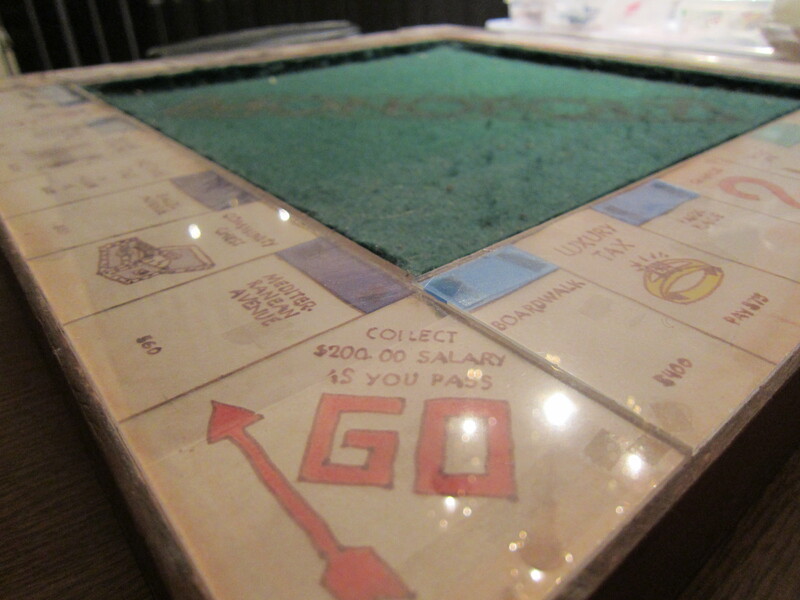 The center of the board had a felt surface, with a gold Monopoly logo inspired by the Franklin Mint board. Oh, how I longed for that set, but there was no way I’d ever be able to afford it. I might actually try to grab one if a good deal comes by on eBay some day, but back then it was the height of luxury to even consider. This helped me get one tiny step closer to having something like it. The board was lighted, as mentioned before, with Christmas tree lights. Each light was mounted under the appropriate space, and when the switch was thrown, would illuminate the tracing paper of the appropriate spot. The spaces were divided using a simple cardboard divider, which kept most of the light where it belonged, but was a little too translucent to do a really good job. 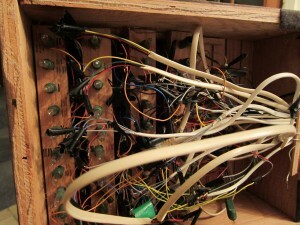 The board and panel were connected with a bundle of telephone wires, with one pair dedicated to each light. 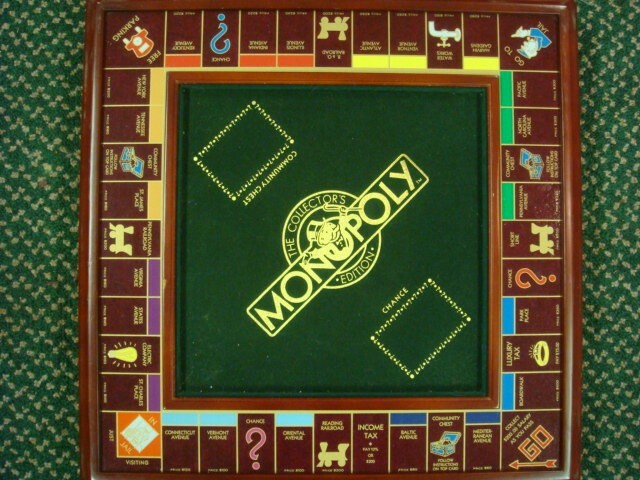 In retrospect, there were many things we could have done that would have made this better, and it’s with an eye towards those improvements that I’ve embarked on this quest to build an even better lighted Monopoly board.